Hifei Swordfish Pro+ 120 amp water cooled esc. The "+" means that this esc comes with a built in data logger to measure Current, Voltage, Motor RPM, Temprature and Throttle Travel. Programing can be done with your transmitter, optional program card, optional USB adapter (Requires Windows xp or newer PC) or optional LCD Program Box/Handheld Unit. 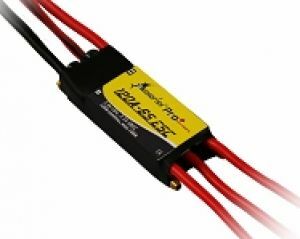 120 Amps, 2s to 6s LiPo cells. Built in Data Logger. Requires Windows xp or newer PC and optional USB programer. Built in BEC(Battery eliminator circuit). -Built-In Data Logger (record critical parameters: Current/Voltage/Motor RPM/Temprature/Throttle Travel), requires options USB programmer. -Runs motor in forward or reverse by swapping any two motor wire connections. -Auto shut down when signal is lost or radio interference becomes severe for more than 0.1 seconds .After radio connection has been reestablished, moving the throttle to the lowest position can restart the motor. Programmability : HiFei ProgramBox, HiFei USB Linker & Data Logger (requires Windows xp or newer pc), HiFei ProgCard. NOTE: USB programer requires Windows XP, Vista or 7(will not work with windows 8).